Description of decorations: Natural stones of various shapes and sizes (Carpathian basalt) are not from this lake, but according to external characteristics are similar to the natural stone from this biotope. On the bottom there is quartz sand of the grain size of 0.1-0.3 mm. Description of equipment: External canister filter Hagen Fluval 306 (1150 l/h), external canister filter Jebo 828 (1200 l/h), air pump SunSun YT-838, (45 l/min), heater with thermostat Eheim Jager 300W, 2 waterproof (IP44) LED lamps RIGID BAR (length 1m, 220V, 12W), waterproof (IP67) LED tape with a JW-66U D4 unit (length 1m, 220V, 24W, 8 programs, blue light is used). Water parameters: temperature is 24-27°C, clear water, light intensity depending on the time of day, GH is 10-12, PH is 8. Description of the area surrounding the biotope: Lake Tanganyika is the second largest lake in East Africa. In addition, it is also the longest (660 km) freshwater lake and the second deepest (1,436 meters) lake in the world. It is relatively narrow, its width varies from 16 to 72 km. It covers about 32,900 square meters. The GPS coordinates for Lake Tanganyika are -6°29’59.99″S 29°29’59.99″E. The lake is divided between 4 countries: Tanzania, Democratic Republic of Congo (DRC), Burundi and Zambia, with Tanzania (46%) and DRC (40%), having most of the lake. It occupies the southern part of the Western Rift Valley, almost all the land along its banks rises sharply and consists of rocky and sandy beaches or steep slopes. The lake is not the center of an extensive drainage zone, however it is fed from sediments and tributaries. Moreover, precipitation accounts for about 63% of the water, and inflows provide only 37%. In total, the reservoir receives about 65 cu. km of moisture. 61 cu. km evaporates, and through the river Lukugu about 4 cubic km flows away. The largest rivers flowing into the lake are the Malagari, Ruzizi and Kalambo, which has one of the highest waterfalls in the world (215 meters). Its exit is the river Lukuga, which flows into the river Lualaba. Lake Tanganyika is so deep that it contains more than a third of all the fresh water on the planet. The lake has no access through rivers that could connect it with other lakes. The pool is known for its terrestrial biodiversity and scenic beauty, like Lake Tanganyika. In the vicinity there are many animals, mostly hippopotamuses and crocodiles. There are also many species of birds there. In the vicinity of Lake Tanganyika there are several forest reserves and national parks. The lake and its surrounding areas provide a wide range of ecosystems that support the lives of millions of people. The surrounding area of ​​Ikola is located in the same area of ​​the general coast of Tanganyika. In addition, it consists of two types of beaches, such as sandy and rocky beaches. As for the coast of Kitumba, we can say that it is of the same type as the coast of Ikola, but less covered with plants. Huge areas of rocky and sandy beaches and steep huge stone walls create various biotopes under water in both the Ikola region and Kitumba, which include magnificent views. If we move further from the coast of Kitumba, we see that huge stone walls come from the bottom of the lake to the surface (not visible on the surface during wet seasons), they also create different types of biotopes for many different species. 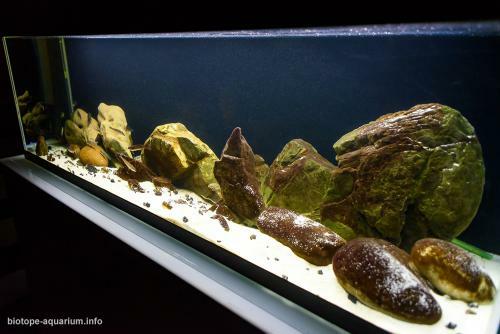 Description of the underwater landscape of the biotope: In the zone of cliffs, the banks are steeply go to a depth of 5 to 15 m, the bottom is covered with huge fragments of rocks, forming large caves. There are no shoals and no higher aquatic plants, but powerful algae carpet can be found even at great depths. Representatives of the genera Chalinochromis, Cyprichromis, Julidochromis, Ophtalmotilapia, Perissodus, Petrochromis, Lamprologus, Telmatochromis, Tropheus live in this zone. Sedimentary rocky zones are part of a rocky biotope, the surface of the substrate is covered with a layer of sediment, somewhere there are patches of sand or silt. We cannot say that this is the deeper part of the rocky biotope, although in most cases the zones without sediments are replaced by sedimentary ones with increasing depth. In some places, rocks and pieces of rocks are already covered with sediment at a depth of several meters. The population of these zones is numerous, both in species composition and in size of populations. The upper part of this biotope is inhabited by various members of the Lamprologini tribe: Neolamprologus spp. such as Neolamprologus buescheri, Neolamprologus bifasciatus, Neolamprologus prochilus, etc. Numerous “princesses” from the complex “brishardi-pulcher”, most of the other members of the genus Neolamprologus. For example, Neolamprologus variostigma was generally caught by Busher at a depth of 45 meters in the Tembwe area in the Congo. At depths of up to 50 meters, one can meet various Lepidiolamprologus spp. for example, Lepidiolamprologus elongatus or Lepidiolamprologus profundicola (occurs at depths up to 100 meters). And closer to the borders with the sandy biotope and directly in the transitional zones there are Lepidiolamprologus attenuatus and Lepidiolamprologus meeli. 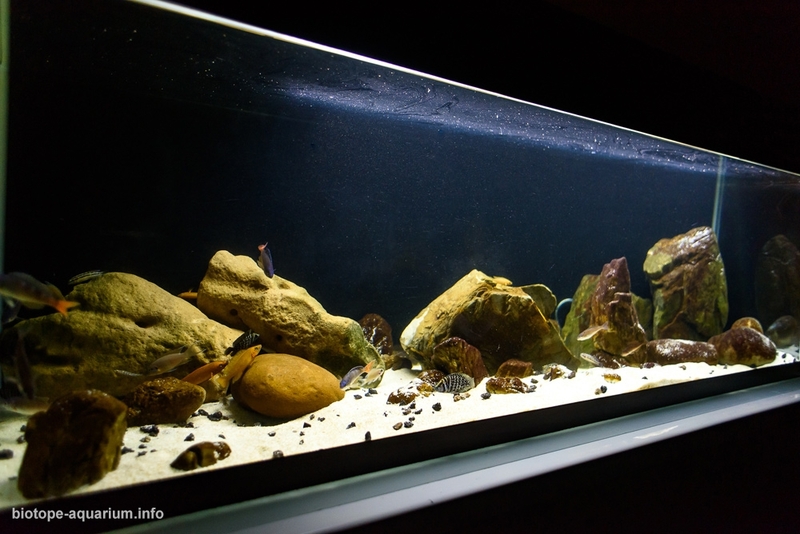 The deep-water part of the rocky sedimentary zones at a depth of 20 meters is also a kind of biotope. Light penetrates to such a depth already greatly weakened due to the thick water column, and as a result algae grow weakly. In some places you can find areas covered with green or brown algae, but usually the stones are simply covered with sediments. There is practically no flow of water at a depth, the life of its inhabitants is calm. 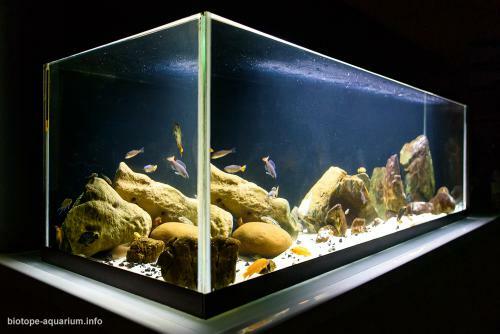 Due to the lack of large amounts of vegetation, most cichlids in deep rocky areas feed on animal food. These are mollusks, various crustaceans, and other fish. Description of the parameters of the habitat: Lake Tanganyika is the second largest in the world in size, which means that temperature and pH fluctuations in it are very low, and the environment is stable. 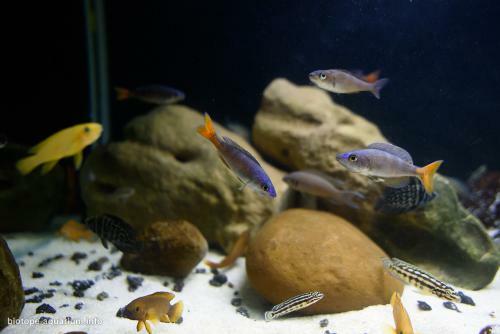 All Tanganyika cichlids need a stable temperature and a large amount of dissolved oxygen in water. The temperature in the lake ranges from 24-30°C with a decrease relative to the depth. Also the water in the lake is very hard (12-19 dGH) depending on the part of the lake and acidic (ph is 8.0-9.5), while the transparency of the water reaches 33 meters. Due to the immense depth and lack of bottom currents in the lake there is no full circulation of water. This causes a high concentration of hydrogen sulfide in the lower water layers. From the depth of 200 meters the “dead zone” begins. There is no life in it, because there is no oxygen. 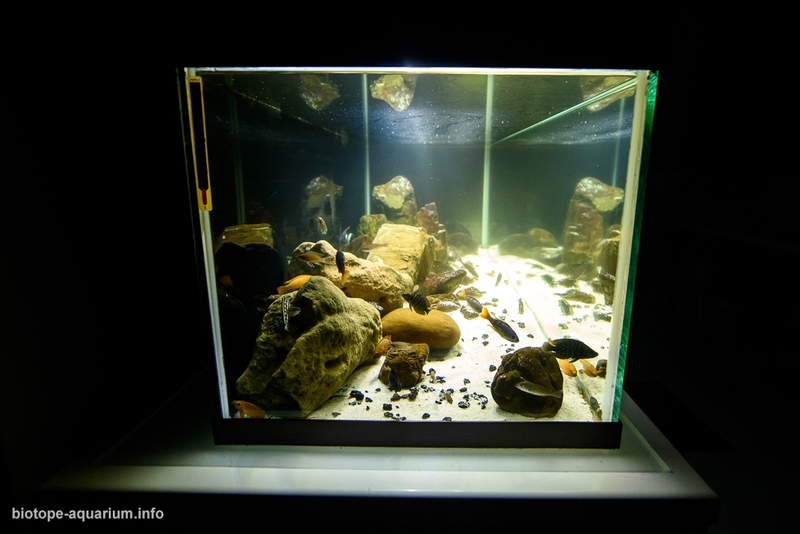 List of fishes and invertebrates occurring in the nature biotope: Cyprichromis, Neolamprologus, Trematochromis benthicola, Benthochromis tricoti, Julidochromis, Xenotilapia nasus, Chalinochromis, Ophtalmotilapia, Perissodus, Petrochromis, Lamprologus, Telmatochromis, Tropheus. Threats to the ecology: Nowadays, the lake water is gradually polluted more and more. Industrial and agricultural waste is dumped into it. Household waste also contributes to it. On the banks of the reservoir there are a huge number of people, but there is no sewage and water supply. All this not only pollutes the water, but also serves as the cause of infectious diseases. After all, the discharge of feces and drinking water are located in the same places. Also, new types of plants are planted, which do not always positively affect the ecosystem. As an example of this, the water hyacinth (Eichhornia crassipes), a plant with a huge speed grows over the lake like a dense carpet and thereby prevents sunlight from entering the water and disrupts the natural oxygen exchange inside the system. And as we remember, the life in the lake is maintained at depths of up to 200 meters, and over it there is already the zone without an oxygen there. So in this regard, the situation is quite tense and deserves the close attention of local government officials, politicians and volunteers from around the world! Directly on the shores of the lake about 1 million people live. The basin of the reservoir is home to 10 million people. The main type of industry is fishing. But nowadays, fish are caught less than in earlier times. In 1995, 180 thousand tons of fish were caught. To date, this figure is less than 30%. In 2017, the lake was recognized as one of the most polluted lakes in the world! With such a pace, this lake may soon die forever or for a long time, and it is quite possible that out of 250 species of cichlids, of which 98% are endemic to the lake, most of them can be found only in aquaria around the world! And this is very sad.